I inherited a beautifully seasoned cast iron skillet from my mother who very likely had inherited it from her mother. It’s an 8-inch Wagner Ware Sidney O model, and a little on-line research into its lineage indicates that it was produced in 1922 by the Wagner Manufacturing Company, based in Sidney, Ohio. There’s something comforting about cooking with a skillet that’s been in the family for three generations, especially one that’s been treated with such love. Cast iron only gets better with age and use, and the inside of my skillet gleams with a beautiful hard dark patina that makes it ideal for searing and high heats. 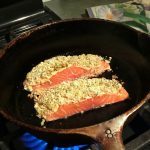 Here’s a simple and delicious recipe by the wonderful Ina Garten for salmon, cooked in a cast iron skillet (or any oven-proof pan), followed by some good tips for cleaning and care of cast iron cookware. Heat the vegetable oil over medium-high heat in a 12-inch cast-iron skillet or large, heavy ovenproof pan. 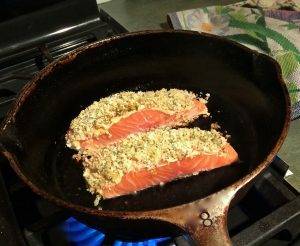 When the oil is very hot, add the salmon fillets, skin side down, and sear for 3 to 4 minutes, without turning, to brown the skin. Keep it clean. We don’t recommend letting your cast iron soak. Wash your (preferably still warm) pan with hot water and use a sponge or stiff non-metal brush to remove cooking residue. To slough off tough bits of stuck-on food, pour a cup of coarse kosher salt into a still-warm skillet. Squeeze a folded kitchen towel with tongs and scrub the pan with the salt. Toss the salt and rinse the pan with hot water. Dry it completely, every time. Moisture is the enemy. Not properly drying your cast iron can cause it to rust. So after rinsing, dry it well and place it on the stove-top over low heat. Allow to dry for a few minutes, then use a cloth or paper towel to rub it with a little shortening, lard, bacon grease, or vegetable oil. Heat for 5 to 10 minutes, remove from heat, and allow to cool. Wipe with another cloth or paper towel to remove excess grease. Store it carefully. Keep your cast iron cookware in a dry place with the lids off to avoid rusting. If rust appears, scour your pan with steel wool to remove it and re-season the pan. That sounds and looks delicious. I no longer have a cast iron, mine was in terrible shape and I didn’t know how to resurrect it. Guess I should get a new one. There’s a nice alchemy in this recipe between the mustard and crunchy panko. Any oven-proof pan will do, but I do think the cast iron gave this a special kick. I shouldn’t have read this post while hungry and the fridge is empty from being away. Wish we had our skillet going with those filets finishing up. Thanks, Anders. I would feel badly for you except that I know you’re within whistling distance of a Trader Joe’s. I love my griswold cast iron pan I bought at an estate sale last summer. It’s lightweight and easy to get an even sear on meat or fish and you can put it in the oven to finish unlike the newer heavier cast iron pans. Here’s to cast iron made in the USA! I keep hearing good things about Griswold — maybe I need to add to my collection. Got the salmon. Almost ready to go. Yum! Great! Let me know how it turns out, Joanne.